HMH Books for Young Readers, 9780544029002, 304pp. Thirteen-year-old Trav has always wondered about his dead-before-he-was-born dad. But when he heads from California to his grandmother's house in rural Minnesota, hoping to learn about his past, he gets more than he bargained for. It turns out his dad was involved in a bank robbery right before he mysteriously disappeared, and the loot from the take is still missing. Along with Kenny and Iz, the kids next door, Trav embarks on a search for the cash. But the trio’s adventure quickly turns dangerous when it becomes clear that someone else is looking for the money—someone who won’t give up without a fight! 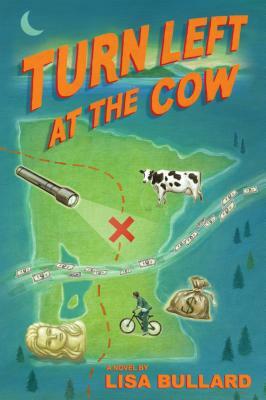 Lisa Bullard, the author of many picture books and nonfiction titles for younger readers, published Turn Left at the Cow in 2013. "Family secrets, an unsolved bank robbery, summer on a lake, a treasure island and a first romance are the ingredients for this inviting middle-grade mystery. . . . A promising fiction debut." "Bullard has a good sense of family and community dynamic and articulates complex conflict and resolution with honesty and humor. . . . With a warm narrative, careful plotting, actual danger, and the beginnings of romance, this adventure has something for everyone." "Through strong character development, Bullard is able to explore family dynamics in a way that is both relatable and informative. Fans of books like Sheila Turnage's Three Times Lucky are sure to enjoy this suspenseful and heartwarming novel."